Since 2003, Trusted Mentors has provided volunteer mentors to adults at risk of homelessness. Building on its success, it has expanded its mission to include other populations at risk of becoming homeless, including low wage earners, ex-offenders, and young adults aging out of foster care. No one else in Indianapolis provides mentoring services to multiple agencies. 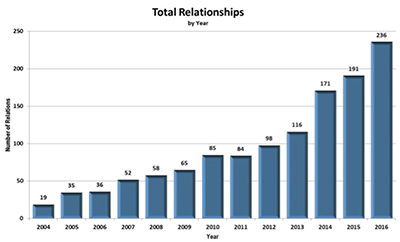 Our agency partnerships have seen consistent growth over the years. The chart below shows Trusted Mentors’ growth in providing mentoring services in Indianapolis. And the power of mentoring relationships to stabilize lives and help people remain housed and out of prison.